At the bottom of those magnetic loops probably lies a dark sunspot, which yesterday unleashed a C-class solar flare. Solar rotation is turning the region toward Earth, and it could emerge into view as early as July 8th. Amateur astronomers with backyard solar telescopes are encouraged to monitor developments. 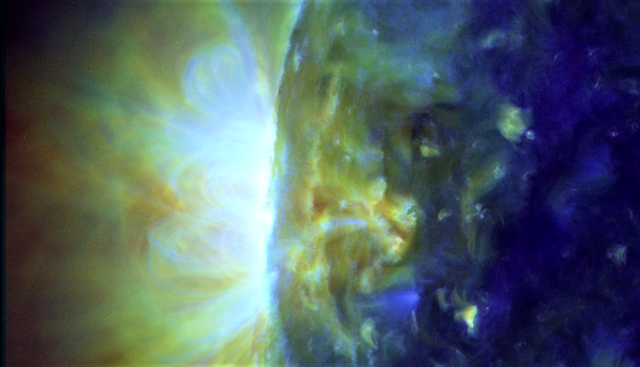 A potential active region will begin to turn into Earth view during the next several days. Solar activity has been stuck at quiet levels for all of 2018 so even the slightest increase in flare activity would be welcomed. More updates in the days ahead. Image by SDO/AIA.